STEADYVOLT Servo Controlled Voltage Stabilizers have many applications. To name a few For Computers, Xerox Machines etc. For Micro processor based equipments like C.N.C. Lathes and a host of other C.N.C. based equipments/Machinery. High capacity 3 Phase Stabilizers for entire factory and vital installations. STEADYVOLT increase life of tubelights & bulbs. For Laboratories and process control equipments. 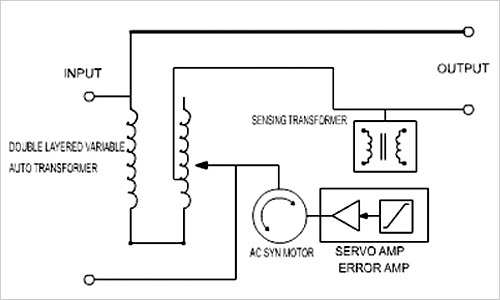 The following are built-in features of STEADYVOLT Servo Controlled Voltage Stabilizer. Digital Voltmeter to read input & output voltage between P to N & phase to phase. 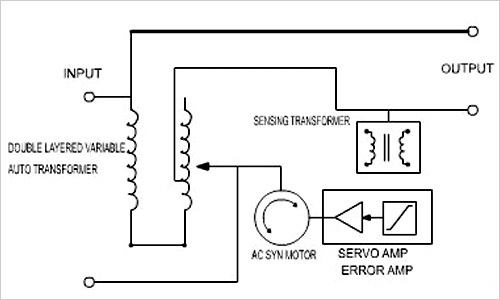 Digital Ammeter to read output current. Input Digital Frequency meter for 3 Phase units only. Timer with 5 sec delay has been provided to avoid nuisance tripping. In case of 3 phase units, single phasing preventer is provided to trip the supply in case of phase failure or phase reversal (Contactor / MCCB/ACB provided at extra cost). Output cut off in case the output voltage goes beyond set limits. In both the above cases, time delay is provided to avoid problems caused by nuisance tripping. Fully solid, state control circuitry, using high stability industrial grade Silicon Semi-conductors. Efficiency better than 98% at full load. No effects of load power factor. Interchangeable plug in control card and module. Unaffected by change in supply frequency between 47 to 53 Hz. Large short time overload capacity, ideally suited for high starting current of inductive motors. Easy manual operation in the unlikely event of auto circuit failure. High speed of correction up to 35V per second. The following additional features can be provided against specific enquiries at an extra cost. Under Voltage & Over voltage cut off through Contactor/Relay/MCCB/ACB in case input/output goes beyond specified range. M. C. B. /M. C. C. B. protection on the input/output for short circuit & overload protection. Alarm to indicate input high/low and output high/low. 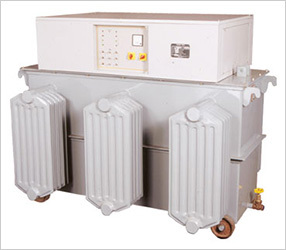 STEADYVOLT Servo Controlled Voltage Stabilizers are mass manufactured in the following ranges. SINGLE PHASE UNITS: Input - 180 - 260 V - single phase 50 Hz or 160 - 260 V - single phase 50 Hz. Output - 230 or 240 V�1% - single phase 50 Hz. THREE PHASE UNITS: Input - 300 - 460 V 3 Phase - 50 Hz. or 360 - 460 V 3 Phase 50 Hz. Regulation against load variation from No Load to Full Load � 1%. Air cooled and oil cooled versions are offered to suit customer's specific requirements.